Note: Examples of most of these are included in the example subdirectory of the download distribution. 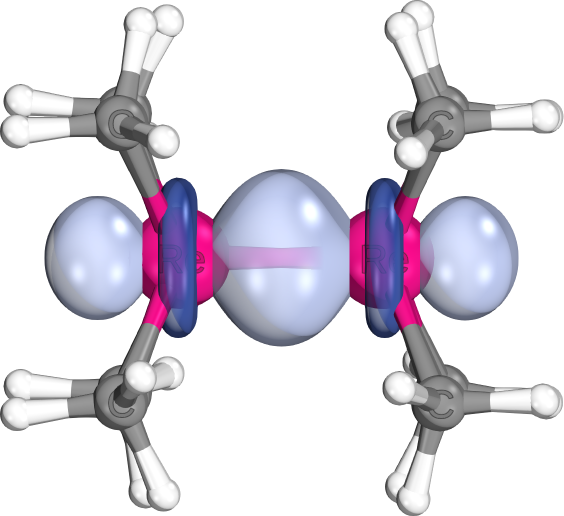 Most of these were discussed in detail in the Intrinsic Atomic Orbitals (IAOs) paper. 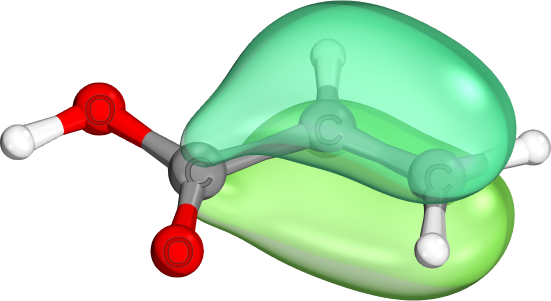 Can be unpolarized (e.g., C-C sigma bonds, if bonding atoms have same electro-negativities) or polarized (e.g., C-O bonds, best seen in orbital charge composition). 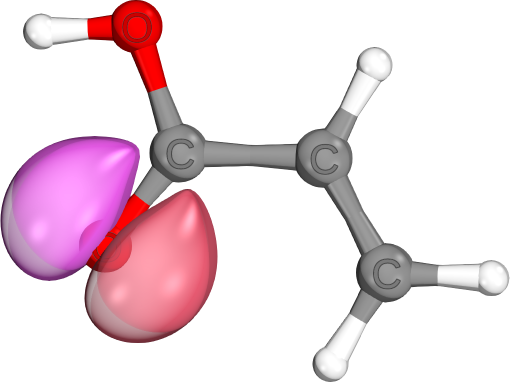 In C≡C triple bonds in conjugated systems, the two π-bond components are often delocalized differently, and to different sides. 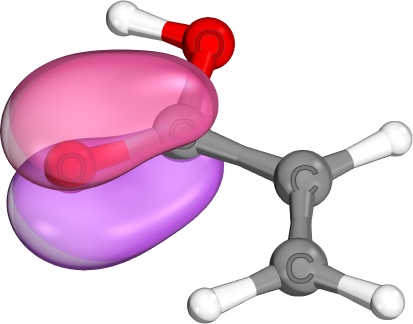 C≃C: Aromatic bonds effectively come in two degenerate shapes, which are mathematically equivalent. One is primarily localized on three centers, the other on four centers. IBOs normally prefer the three-center version. 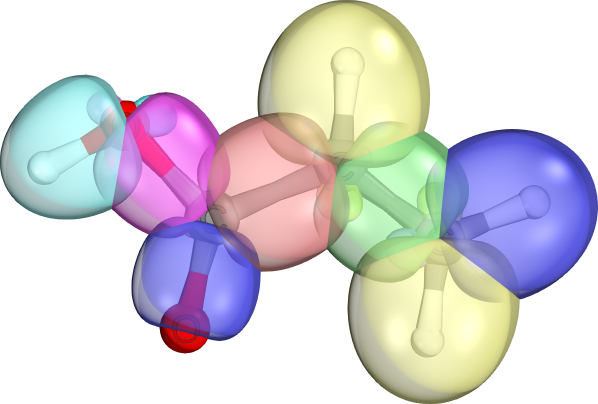 But, especially in reaction paths, the type of the pi bonds can change. 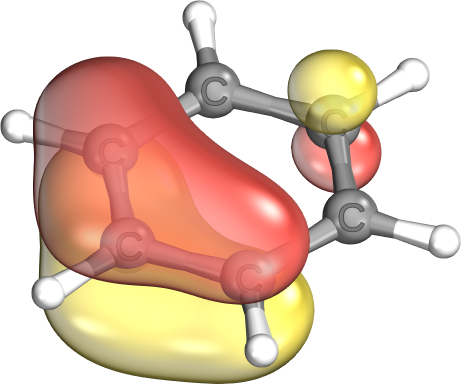 Banana bonds are most often seen in cyclopropyl groups. 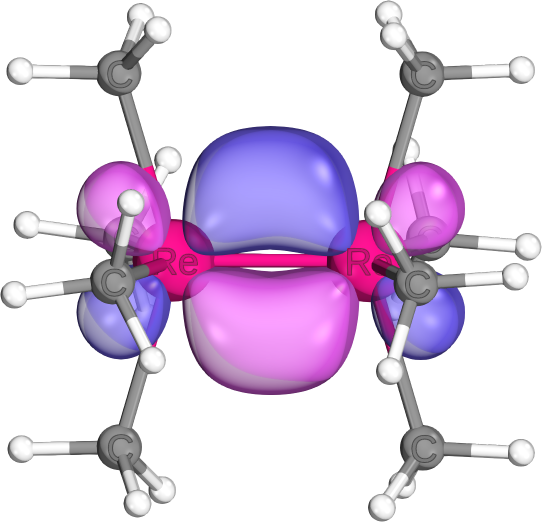 They can be viewed as hybrids between regular σ- and π-bonds. 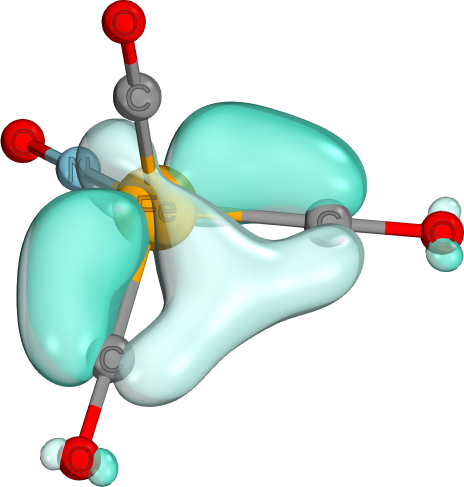 While they are often highly-localized, their increased π-character still predestines them for π-bond like reactivity patterns. 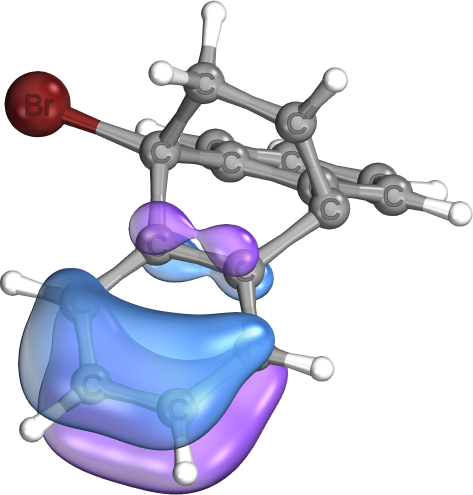 Normally we write double bonds as one σ- and one π-bond, but they can also be written as two equivalent banana bonds. Both descriptions are physically equivalent. IBOs normally produce the former description, because they prefer a pair of one highly localized and one semi-delocalized orbital to an equivalent description of two equivalent somewhat delocalized orbitals. In other localization methods (e.g., Boys localization) this is different. 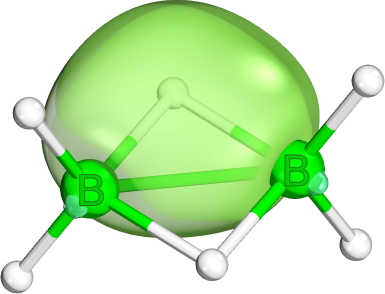 A variation of this pattern is also commonly seen in Boranes. 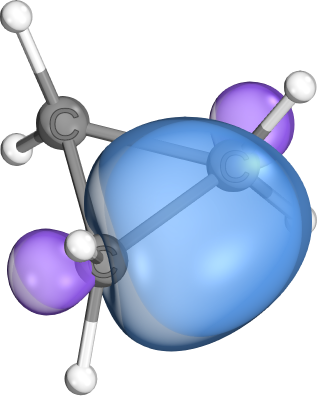 Here a very similar orbital shape occurs and is used to bridge a two-electron (2e) chemical bond over three centers (3c). 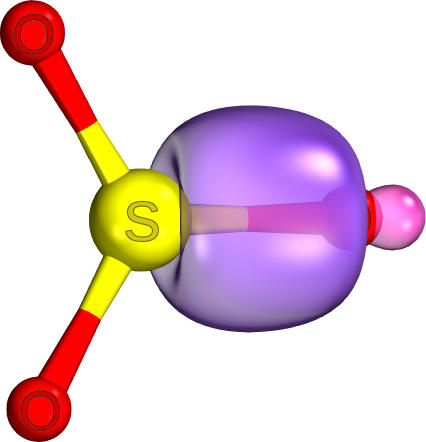 These bonds are electronically simple (i.e., well described by mean field theory), but cannot be easily written as Lewis structures. Commonly seen in cationic systems involving cyclopropyl groups (e.g., carbo-cations) and reaction paths involving cyclopropyl ring opening or closing reactions. 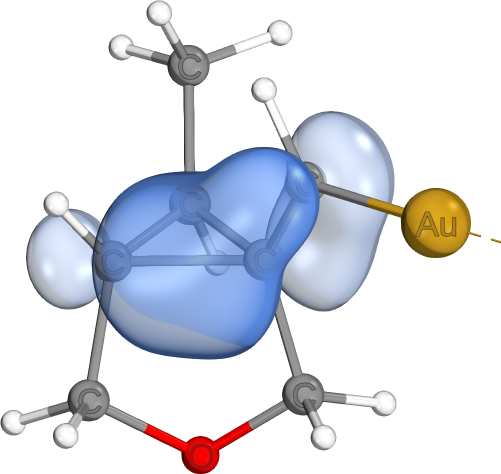 The example is taken from The Stabilizing Effects in Gold Carbene Complexes, where such bonds are shown to play a major role in stabilizing carbo-cation sites (instead of pi-backbonds from Gold, as one might imagine).